I admit that I am a fan of small business, especially those that obviously put a lot of thought and care into their craft. I was very impressed with the attention to detail in every card at Bunny Prints. The personalized birthday invitations are so cheerful and colorful with a huge assortment for every imaginable theme. The personalized candy wrappers are very unique and would be a hit at any baby shower or birthday party. I wish I had found these when I was expecting…my husband could have passed out candy to his buddies instead of those dreaded cigars. 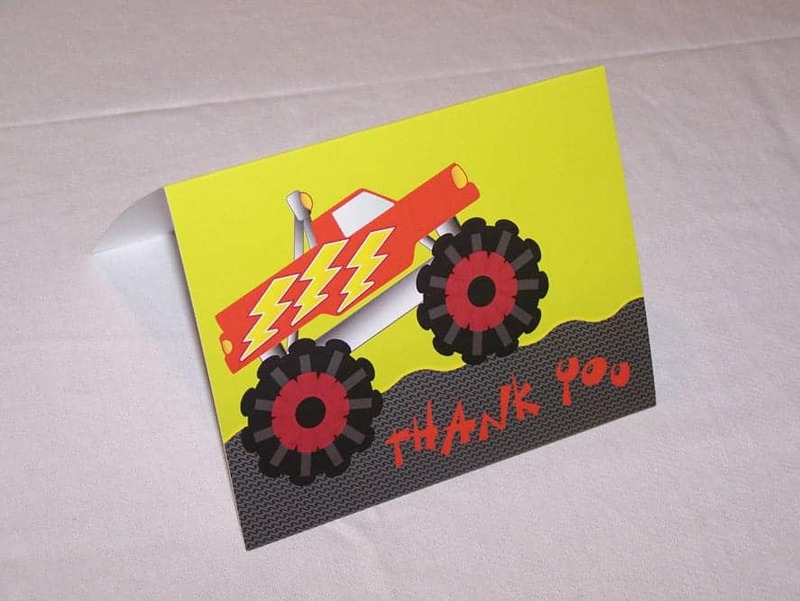 I received a pack of “Monster Truck” Thank You cards because my boys are huge Monster Truck fans. I sat down one evening with my kids to send the thank you cards to the medical staff who cared for my son in the burn unit. The only problem that I had is that my boys refused to un-hand the cards because they liked it so much. These cards were very sturdy and well made as was evident when I had to wrangle it away from my boys. As I browsed through the huge selection on the website, I noticed there are the same cards for birthday invitations which would be perfect for my son’s birthday in October. If you have a special event coming up soon then I highly recommend you view the selection and affordable pricing at Bunny Prints. the Zebra Print Christmas Tree Photo Cards! If baby #2 turns out to be a girl, I’d get the cute Bunny Baby Shower Thank You Cards! Voted for you at Picket Fences. Thanks. I like the adorable Ladybug Birth Announcements!